But then it started to get dark. And sort of late. So I got out of the pool. Ran home. Got a shower. And I got in bed. My parents didn’t tell me to. My brothers didn’t follow. And all this time… it was still actually light out. I was such a high-strung, type-A nutjob that even in middle school, I had to run home and ease myself into my 9PM bedtime because I was a massive dork. Ugh! You’re killin’ me smalls. I actually remember lying in my bed with the lights out that night, the tiniest bit of sunlight peeking through the window… and tons of shrills and screams from the kids who were still outside having a blast soaking up every last summery drop, and who consequently had to be dragged home by their parents, kicking and screaming because they were… normal. As a side note, I should mention that this was probably the night before a really important morning – which included shaving my legs for the first time after my mom made it clear that I wasn’t allowed. HA! I showed her. I woke up super early after carefully planning my mission for two weeks because there was no way I was headed to that first day of school with hairy legs. I was wearing an acid wash jean skirt FYI… and I definitely wore it with Samba soccer shoes. And I never played soccer, ever. Somehow, this made me as cool as Kelly Taylor, and I was fully convinced I’d find my own Dylan (sideburns included) in a getup as such. Don’t worry. I’ve lightened up some. I go to bed around 10PM now, and I’m certainly not anywhere near as type-A as I was, but that’s only because I’ve been forced to change. Trust me. If there were two of us that type-A in this house? No one would make it out alive. Plus, being type-B, or in my case, type-Z, or whatever you’d like to call it is an excellent excuse for leaving your clothes all over the floor for two whole weeks. Which is definitely… not… where… mine… are. So do you want to hear about this mess in a dish? Because I didn’t really have intentions of sharing even though I nearly did a swan dive off my dining room table into the whipped cream. My mom used to make the best trifle when I was younger. It was filled with pound cake cubes, layers of a creamy vanilla custard-like pudding and tons of sugary berries and fruit. 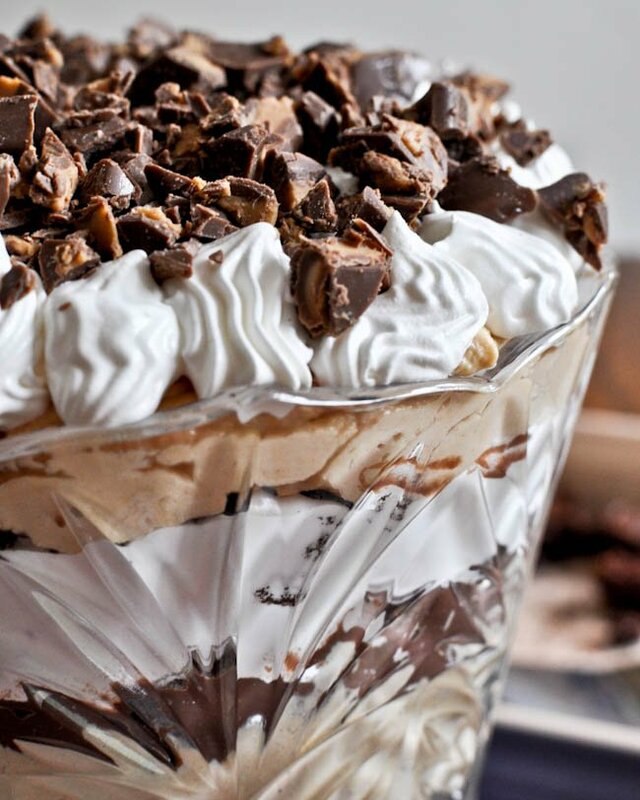 I haven’t thought about it in years, but when I was in dire need of a dessert for Labor Day festivities, many Facebook friends suggested a trifle of some sort. Actually, all I could think of was chocolate and peanut butter. I don’t know why. It’s just on my brain most days. But when I added “trifle” to those thoughts, good things started blooming. Sure enough, the only way a trifle was happening was if it consisted of piles of those two ingredients. I have to be in “a mood” to have fruit for dessert, and Sunday was not one of those days. Bring on the fudge. Here’s the deal. Since you’re going to sandwich squares of fudgy brownies between a make-shift peanut butter mousse, I’m telling you to use store-bought things. Of course, you can make your own brownies if you’d like to. But on the last day of summer, creaming and beating butter and sugar for a homemade brownie that was essentially being mashed into a bowl of goop? Not my idea of fun. I did make my own whipped cream, but that’s simply because I had a pint of cream that was ready to go meet Jesus. Otherwise… do your thing: boxed brownies, creamy peanut butter, instant pudding and a big ol’ tub of cool whip. A few bites of this stuff won’t kill you folks. It was the epicenter of the 1990s. Hopefully by tomorrow I’ll have some real food for you to eat around this joint. Unless you want to survive on trifle. I totally can.